I am honored to be selected as “Artist At Sea” Science Communication Fellow on board Titanic Discoverer, Dr. Robert Ballard’s Exploration Vessel Nautilus this summer. I will be traveling in July on one leg of a 6 month-long expedition, starting in the Galápagos Islands, traveling through the Eastern Pacific towards the Baja Peninsula and ending in San Diego. A team of scientists who will be mapping out never before seen ocean floor topography along the route with a state-of-the-art multi-beam sonar mapping system connected to the hull of the ship. The data and mappings will be revealed in real time onto screens on board the ship. I will be collaborating with scientists, educators and a writer onboard to use this live feed of data to create artwork during and after the expedition. The ship is also equipped with telepresence technology with a live video and audio feed- We will be broadcast with groups all over the world while at sea. 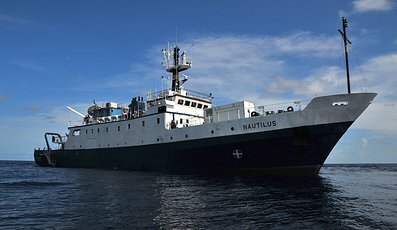 You can follow along the expedition – go to http://www.nautiluslive.org/ to tune in!